Picture if you will an old school luggage cart, filled with 9 very large suitcases, accompanied by 12 people, two bicycles, a ukulele, and many other carry on bags, rolling up to the luggage check in desk at Washington's Union Station. Only 4 individuals are actually holding tickets for the train. 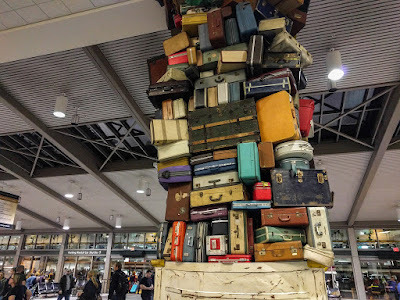 It was at this point that we learned that luggage checked on trains has the same weight limit as luggage checked on airplanes - 50 pounds - and not one single piece of luggage was under 50 pounds. Enter our hero, Tony, the porter struggling with the huge stack of very heavy suitcases, who literally saved the day. The 4 train ticket holders are members of the refugee family my church has been sponsoring for the last 2 years. Living in the suburbs of expensive Washington DC was not going to be a long term option for their financial independence, so 4 members of the family of 7 were moving. There is support of a welcoming immigrant community in the midwest that really would be a better fit. Left behind would be the 3 adult children of the family, all on their own path to independence (but emotions were high none the less). This was not Tony's first rodeo, and he knew the train luggage rules far better than the staff at the desk was willing to devulge. Their "It's too heavy, we won't take it" was met with Tony's save the day enthusiasm to help this family. Did you know that you can buy boxes from Amtrak for $5 and check them, paying a nominal extra bag fee (far less than postage)? Tony did. So a few pounds were removed from each bag so we could get most bags checked. In the frenzy of repacking we managed to pack Tony's own jacket into one of the boxes. It was rescued just in the nick of time, phew! I am not sure how plugged in Tony was to the group dynamics, but he figured out that my friend needed to get this family on the train, so he took his cues from her. I could tell Tony knew that the family was in the midst of something major, and were struggling with the process. But Tony spoke the international language of niceness. "Come with me, I'll get you early boarding," he said, as he whisked all of us - ticketed, unticketed, bicycles and ukulele - right out on to the platform. The conductor was NONE TOO PLEASED ("Who has tickets! Who has tickets!" he kept yelling) but Tony affably got everyone settled on board and then kindly whisked the rest of us back out to the waiting area. I have been thinking about Tony and the chaos that we brought to his day ever since, because he made it So. Much. Better. He spoke the international language of niceness, something we can all appreciate.